The LG G4 was one of the finest phone with premium specifications released earlier in 2015, I am actually not a fan of LG smartphones but I can plainly pinpoint to you that there device are awesome. Ever since the Cyanogen Mod died, Lineage OS has been gaining the chart in custom ROM platform more rapidly. Thus they’re extending there supports in more of the well known spetacular devices. As usual the Lineage OS 14.1 Custom ROM running on the latest Android Nougat 7.1 update has arrived on the LG G4 smartphones via an UNOFFICIAL build and trust me, the ROM is as stable as ever. Thus if perhaps you want to taste this ROM on your device, then you’re totally free to do so. The Lineage OS custom ROM brings a well known customization abilities and most of all, it’s smooth, stable and can be used as a daily driver. However flashing a custom ROM on your LG G4 requires you to have your bootloader unlocked and be rooted which may void your warranty. Also have a TWRP recovery installed. If perhaps you’re flashing this ROM for the first time or coming from another ROM, try to avoid restoring apps backup using Titanium Backup. It may break things up. Also don’t restore system data using Titanium Backup. Note: You are the only person doing changes to your phone and tech viola cannot be held responsible for any damages or mistakes you encounter while flashing this ROM. Perform a complete Nandroid backup for you may lose your data. Enable USB debugging. To do this navigate to Settings>>About Phone then tap build number 7 times. Go back and hit the Developer option then enable USB debugging. Battery Must be Charged above 50% before following the below procedure. First download the unofficial Lineage OS firmware for the LG G4 smartphone. Also download the necessary Lineage OS Nougat Gapps. and place it on your device memory card. Next turn off your device. Wait while the shut down operation is completed and then enter into recovery mode on your LG G4 by pressing and holding the Power and Volume down button at the same time for a few moment. Once you are in the recovery mode, wipe data/factory reset, wipe cache partition, wipe dalvik cache and Format the System partition. Now you’ve performed a complete wipe. As said earlier make sure you’ve taken a NANDROID backup of the current ROM. Now navigate back to the main menu of the recovery mode and select “Install Zip From Sd Card” followed by “Choose Zip From Sd Card”. (I.e if you’re using the TWRP custom recovery). Next navigate to the unofficial Lineage OS firmware for the LG G4 you placed earlier on your SD card. The file should be in .Zip so locate and select it. Now confirm the installation from the next screen and the flashing process will begin. Once the installation is complete, follow the above steps all over again to flash the Lineage 14.1 Nougat GApps package via TWRP custom recovery. Now once you’ve done the installation process as speculated, navigate back to the recovery main menu and reboot the phone by selecting “reboot system now” option from the recovery menu . Congratulation!! Your LG G4 will boot now and it might take about 5 minutes to boot on your first time. So please wait. 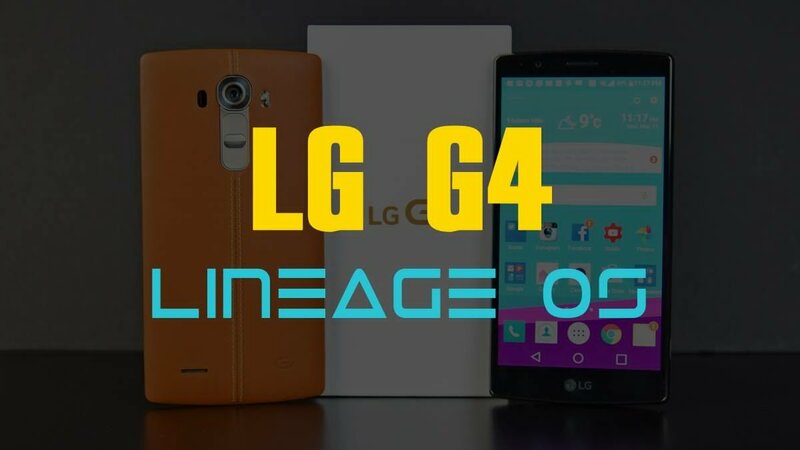 Once the booting process is complete, complete the initial setup and simply check if you’ve the Unofficial Lineage OS 14.1 Nougat 7.1 Custom ROM installed on your LG G4! Thus Go to Settings > About Phone to verify. After CyanogenMod has announced the discontinuation of there service, the Lineage OS has been confirmed to be it’s replacement and this time, it will be more better. However the good news is that the unofficial Lineage OS 14.1 ROM is now available strictly for the Galaxy S7 edge. Earlier said, the official build of the Lineage OS ROM will fully be available on January 2017 but this doesn’t mean you shouldn’t play around with the unofficial build while waiting…. The new Lineage OS source code was actually borrowed from the CyanogenMod and thus the process of flashing this ROM should be the same as the CM 14.1. But it should be noted that the Lineage OS has come loaded with lot’s of customization and optimization capabilities which can take your device to a whole new next level. As for the unofficial build port, all credits should go to the developer FevaX who managed to boot the first unofficial build of the Lineage OS ROM on Galaxy s7 edge. Since this is an initial build of the Lineage OS ROM, it should be known that the ROM is not yet fully stable and you may experience some bugs while using it. Thus it’s advisable that you’ve a backup ready before proceeding with this procedure. As usual installing a custom ROM on a Galaxy S7 Edge (hero2lte) requires the bootloader to be unlocked. and this may VOID your warranty and may delete all your data. So make sure you’ve your backup ready before proceeding further. The installation process should be the same as usual. Thus a Root access. is required to stay in track and you also have to flash a TWRP custom recovery on your Galaxy S7 edge. This procedure is only for installing Unofficial Lineage OS 14.1 ROM on Samsung Galaxy S7 Edge. Please do not try this on any other Samsung Galaxy S7 Variants. Also Note that techviola will not be held responsible if you brick your device while following our procedure. Simply do things as instructed and you will get a successful output. Perform a Dalvik Cache wipe and factory reset before proceeding from the Recovery Mode. First download the unofficial Lineage OS firmware for the Samsung Galaxy S7 edge. Also download the Lineage OS Nougat Gapps and place it on your device memory card. Next turn off your device. Wait while the shut down operation is completed and then enter into recovery mode on your Galaxy S7 Edge by pressing and holding the Power, Volume Up and Home buttons at the same time for a few moments. Next navigate to the unofficial Lineage OS firmware for the Galaxy S7 edge you placed earlier on your SD card. The file should be in .Zip so locate and select it. Now confirm the installation from the next screen and the flashing process will begin. Once the installation is complete, follow the above steps all over again to flash the Lineage 14.1 Nougat GApps package via custom recovery. Congratulation!! Your Samsung Galaxy S7 Edge will boot now and it might take about 5 minutes to boot on your first time. So please wait. Once the booting process is complete, simply check if you’ve the Unofficial Lineage OS 14.1 Nougat 7.1 Custom ROM installed on your phone! Thus Go to Settings > About Phone to verify.